Being a woman in Congress today is no longer news. In the 112th Congress, for example, 76 women occupied seats in the House of Representatives out of a total of 435 voting members, and 17 women served in the Senate. Not exactly even, but substantial. It wasn’t anything like that in 1928, when Ruth Sears Baker Pratt was elected to serve two terms in the House of Representatives from the wealthy “Silk Stocking District” in Manhattan. Serving in Congress was the culmination of a legacy of public service that began in 1917 when the U.S. entered World War I and Ruth chaired the city’s Woman’s Liberty Loan Committee, which sold bonds to support the war effort. In 1918, she appeared on the national scene through an appointment as Vice-chair to a major committee within the Republican Party. 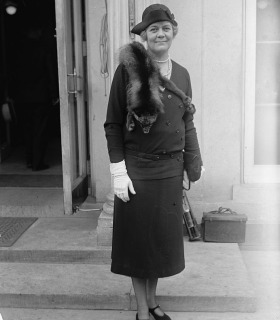 In 1925, she was elected as the first woman on New York City’s Board of Aldermen, now called the City Council, where she supported major infrastructure projects to support the city’s growth, including a parks commission, tunnels under the East River, and the building of the Triborough Bridge. In Washington, she was soon in the midst of tumultuous change. She favored repeal of the 18th Amendment and its ban on alcohol, but was not able to persuade her Republican colleagues to back the initiative. As the Depression deepened, she continued to support President Herbert Hoover and even seconded his re-nomination at the 1932 Republican National Convention. Her political career, like Hoover’s, didn’t survive that election. Even so, Ruth remained active. She was a force in the effort to reshape the Republican Party after its losses in the 1932 Presidential election and the Congressional elections that followed in 1934. She was also the chair of the organization now known as the National Endowment for the Humanities and later served as president of the Women’s National Republican Club.